Materjalid ja kokkuvõtte leiab siit. rõhutute teatri koolitaja Uri Noy Meir, kes on viinud läbi töötubasi Nepalis, Israelis, Indias, Palestiinas, Ameerikas jm. Koolitus toimub inglise keeles. trained with renowned Theater of the Oppressed (T.O.) practitioners such as Chen Alon, Barbara Santos, and Sanjoy Ganguly. Uri worked in Israel with University students and political activists, offering transformative workshops using T.O. Uri has also led workshops in Nepal, India, Italy and, with the ImaginAction team, in Northern Ireland. Uri offers workshops that integrate T.O. practices with participatory photography. 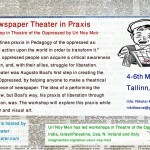 He is also involved in developing networks of Theater of the Oppressed practitioners all over the world using the internet as a platform for sharing meaningful and transformative work all around the globe. Uri lives in Rome, Italy. 10.00-13.30 Games, Creating synthesis between Word, Image and sound. Toimumiskoht: Koolitus toimub Toomklubis, Vene tänav 6.